Researching dog training collars for unwanted behavior may have you foaming at the mouth due to their “shock” treatment. Rest assured, though, that these devices have come a long way since they were first introduced and they no longer deliver painful electrical shocks to the animal wearing them. If you’ve ever had an electronically stimulating massage pad put on you, you’ll understand the exact sensation that a pup feels when one of these is triggered. It doesn’t hurt, but it certainly noticeable enough to get the pup to pay attention and quit their bad behavior. There are other types of collars available, though. Some use scents to deter your pup; some use sound or vibration. Even if you are still a little uneasy about “shock” collars, there will be something on this list that works for you. The biggest problem with shock collars is the human using them. When used properly, they can be an effective and non-harmful tool to train dogs. They can, however, be abused. Those should never be used to punish an animal. This kind of abuse is punishable by law. We have included “shock” and no-shock training collars on this list. If you’re averse to the shock ones, you’ll still find value in this list. If you’re happy to give an electronic “shock” collar a try, we can vouch for them being perfectly safe if used correctly. Let’s get right into it – the top 5 dog training collars that we’ve come across on the market. The WOLFWILL no-shock dog training collar is a highly effective training device that works on tones and vibrations to get your pup’s attention. These feedback methods are highly effective at promoting better behavior in dogs who need a bit of training for barking, digging, chasing, or biting. The device works up to a distance of 660 yards and has 16 different intensities of vibration. 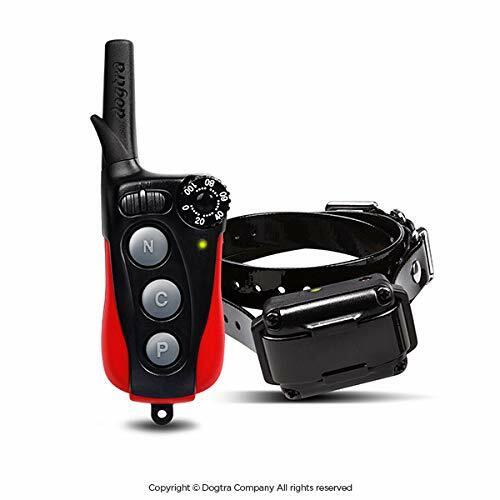 The remote control can also be linked up to two collars at the same time, but you will need to buy the other one separately. It’s also 100% waterproof, so you on’t have to worry about your furry friend taking a dive into the pool after some intense training! The SD-425 FieldTrainer is an extremely versatile e-collar. 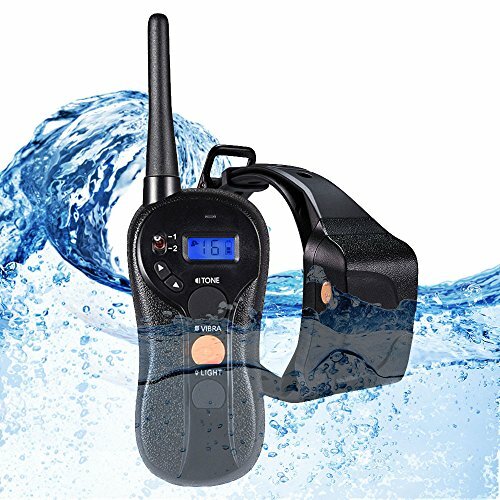 This is a high-action, sporty device and can be programmed to work with up to 3 collars at one time, and is often used to train hunting dogs in the field. The SD-425 can be submerged up to 25 feet, and works at a range of 500 yards from the transmitter. It can be used on caniines with necks of 5 to 22 inches in size, and features 7 different levels of static stimulation (low to medium range). These can be delivered in nick (momentary) or continuous modes. Vibration and tone training are also options. The lithium-ion batteries charge fully in 2 hours, an last 50 – 70 hours per charge. the transmitter comes with a training DVD and operating guide, and customer support is available 6 days a week. 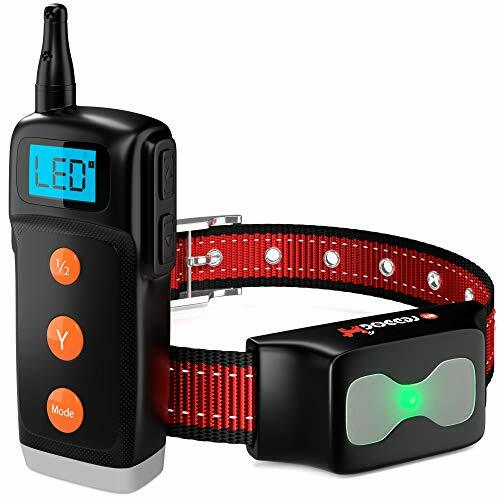 This electronic collar works for dog trainers and dog owners who are novices when it comes to training. It’s water resistant, making it easy to use in any weather, and if you have a pup who loves swimming. The device has 4 modes – beep, vibrate, LED light, and shock. The vibration and shock functions are adjustable on 10 levels. It can be set to go off automatically for bark control, or set to be controlled by the human for more specific training. You also get a free bright neon light bulb that hangs on your dog’s collar, so you’ll always know where they are in the dark! Sizes seem to run small, so buy one up! Although this one does come in sizes for large dogs, it does cater for pups as small as 10 pounds. It is also quite compact which makes it perfect for smaller dogs as it isn’t too heavy around their necks. For little but fearless pups who enjoy a good swim, the collar is waterproof and works at a range of 400 yards. It can also be extended to work with a second one, if you have another dog that needs the same training. This electronic device has 3 different stimulation modes to choose from – Nick, which is a sharper, sudden sensation, Constant, which is a more drawn out stimulation, and Pager, which is a vibration similar to what you would have on a cellphone. The collar outputs a low to medium stimulation that can be controlled on 100 levels using Dogtra’s patented Rheostat Intensity Dial. One of the reasons we’ve chosen this as our best choice for small dogs is the vibration option – small dogs especially are more sensitive to sensations. This collar has enough choice of stimulation to be a great option for smaller, more sensitive, and perhaps more fearful dogs. It’s also more compact than most, meaning it’s lighter and easier for your pooch to wear. This simple, no-fuss collar is designed for one function – teaching your dog to walk on a leash. With options for dogs from 5 pounds to 130 pounds, and multiple color choices, this is a simple yet stylish device for basic training. 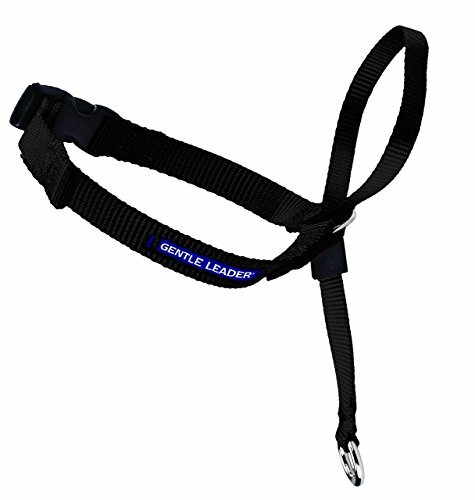 With one loop around the muzzle and one around the back of the head, this collar provides immediate, gentle control over the direction your dog is walking and how close they are to you. It’s safe and can be adjusted to fit your dog, so it doesn’t cause pain or choking. The placement of the muzzle loop is also such that your pup can still open their mouth to eat, drink, or pant. If you’re looking for a training collar for your dog, there are a few things you should check out before you buy one and start using it. Not all dogs are going to react the same way to collars, so it is important that you are aware of your dog’s nature and personality. Some dogs are going to require more strict and strenuous training, and some are going to take to it right away simply because they are more timid. 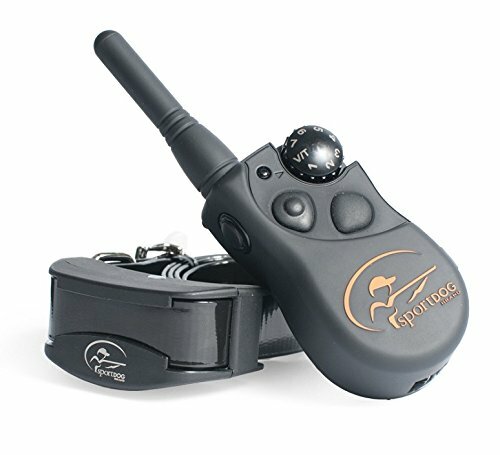 If your dog is rowdy and hard to control, you will most likely need something that will catch his attention and keep it. An electronic collar with a bit of a static correction might be best. If you have a quiet, timid pup who simply needs some direction, a non-shock collar may be the option to go for. Yes – if you feel it, your dog will feel it more. Put the collar on yourself (yes, on your throat), and let it zap you with static electricity. If you are too scared to do this, would you really put it on your dog on the off-chance that it may hurt him? Test the vibrate intensity on yourself as well. You want to have a good idea of where to begin with levels of shock and vibration, instead of testing it out on your poor pup until you get it to an appropriate intensity. 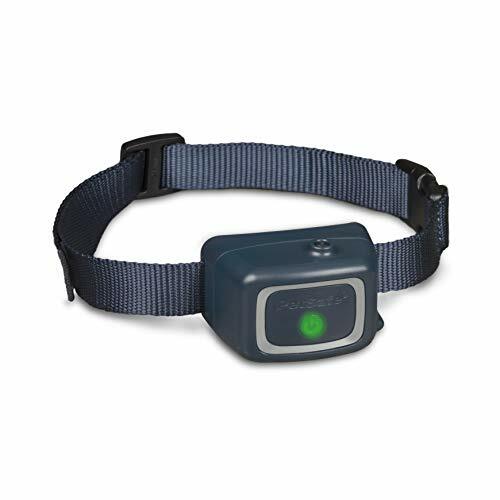 There are various behavioral problems you can address with electronic collars. Barking, chasing, learning perimeters, obedience, or avoiding areas are a few common ones. Training your dog to stop unnecessary barking doesn’t need as intense a collar as training a large dog to stop being aggressive would. Training sessions should NOT be a punishment for your furry friend. Whatever the behavioral issue you’re trying to rectify, your training method should always include reward when your pup gets it right. Positive reinforcement means getting your pet to associate good behavior with reward and wanting to behave better for that reason. This should always be the aim – focusing on the positive, rather than the negative. Collars should reinforce this, instead of leading your pet to associate certain behavior with pain or punishment. When your pet sees the collar, they should anticipate fun and rewards – not fear and pain. Used correctly, this can be super effective! With the advancement of technology, shock collars have become quite safe for pets. They don’t deliver an electrical “shock”, as such. It is more a low to medium intensity electrical stimulation similar to what you might feel using electronic massage pads. This is usually more uncomfortable to pets than painful. How do I know if the shock collar intensity is appropriate for my pet? Test it on yourself. If you can’t handle it, your pet won’t handle it. If it’s moderately uncomfortable for you, it is likely to be highly uncomfortable for your pet. Is there a specific age that is good to start training a dog with a collar? Most of the collars reviewed indicate that they can be used from 6 months. Again, though – you know your pup best, so take into account your pet’s temperament. Some collars do a great job at certain functions or for certain dogs. Sometimes, we need to get a bit of specific to make sure we end up with the right training collar, both for our purpose, and for our pup. A no-shock no bark collar that gives off a spray to deter your pup from unnecessary barking or whining. Water resistant and fitting dogs from 8 pounds up, this collar is a simple, humane alternative to prevent noise. The collar works on sound and vibration of your dog’s vocal cords, which triggers it to emit a burst of spray. This will usually startle your pup and stop the barking. The collar comes with one unscented spray and one citronella spray. Both are harmless for pups and humans and dissipate quickly. 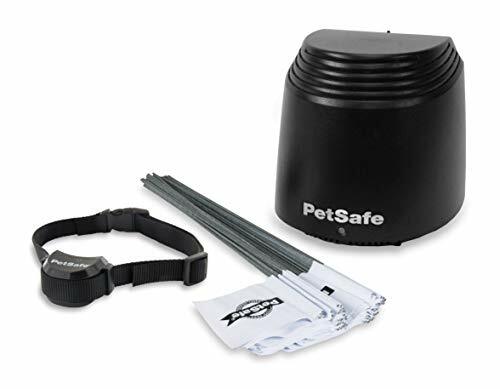 This training set keeps your dog within a certain perimeter using an invisible fence system. It’s perfect not only for within your own yard but if you’re an adventurer who likes taking your dog with you when you travel. This barrier uses flags that you can move around freely, as opposed to others that need to be buried. These can be spread out to a space of up to 105 feet in all directions, and this can be widened by purchasing additional transmitters. This also works for multiple pets, provided they have a collar. There are 5 levels of static correction. When your pet approaches the edge of the zone, the collar emits a warning tone. If he persists, the collar will deliver a static correction. Be sure to set the static pulse to something appropriate for your dog. This barrier is more for keeping your pet away from a particular area than it is keeping them in one. 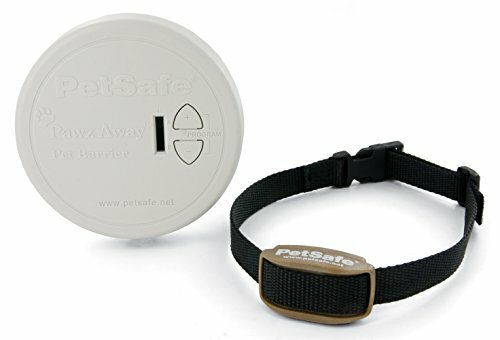 The transmitter is placed in or near the area you want your pet to avoid, and when they come near it, the collar emits a series of tones to warn your pet off. This will be accompanied by a set of progressive set of static corrections. This will stop when your pet leaves the area, or when the 15-second time-out is reached. Pets should learn quickly to avoid the area altogether! There is also an outdoor option, a threshold option (for stairs), and you can buy extra transmitters and collars separately. The are many different dog training collars available out there to help change bad behavior. Simple, no-fuss leashes, remote control electronic collars controlled by the dog owner, and perimeter training collars that can be set up and require little input from the trainer. Whatever your training requirements, you’ll find some kind of dog training collar that will cater for your (and your pup’s) needs. Don’t just leap into it unprepared though – do your research and make sure you get something appropriate. Have you had success with other dog training collars? Let us know in the comments!